Pictures > Words // We live in an increasingly visual culture. It’s not that people can’t read … it’s just that they don’t. Find ways to add more pictures and images in your bulletin to communicate what you are trying to get across. Find some pictures of people from your church and include them in the bulletin. Use images to draw people’s eyes to what you want to communicate. [Check out how Christ Church of the Valley uses images to communicate!] NOTE: CCV’s bulletin is my favorite of all the ones I received. I love the short story about people being impacted by the church … love how clear what to do if I’m new … love how simply they communicate next steps. Declare Your Strategy // Can you articulate your approach to ministry in a straight forward way that makes sense to people who are reading it for the first time? 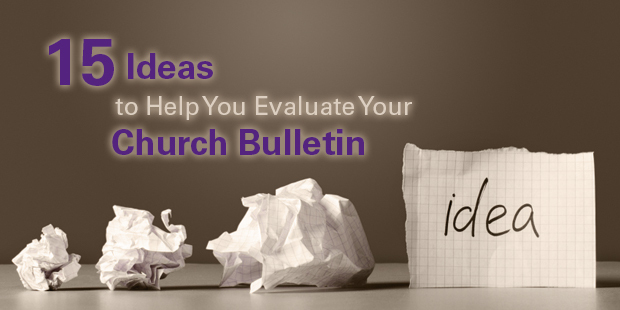 The bulletin is a great place to communicate to your guests how your ministry “works” and what their next steps are. [I think First Baptist Spartanburg does a great job summarizing their 4 fold strategy in their bulletin.] I love the reflective questions listed … they engage people in self reflection and invite them into the mission. Perforated Response Cards // Many of the programs that stood out to me had perforated parts for people to tear off and respond. This is an effective way to follow up with first time guests or collect information on how people are reacting to the service. [Check out how First Christian has a “week specific” response tear off that lines up with the announcements for that weekend.] They were looking for people to volunteer with transportation and a Christmas project and had a simple check box response form to respond to those asks. Best Use of a Beard // [I love the cover of Open Door’s Bulletin.] Too much fun. I’d love you to provide a link to your bulletin (or program!) in the comments section. What do you think your piece does particularly well? At my church we focus our bulletin totally on the first time guests … I don’t think our “regulars” look at bulletin at all. We used to have this cool “story of us” on the inside of our program every week for about 18 months. I liked that piece because I think it brought people up to speed quickly on who we are. I also like our current version of “what to expect” … I think it makes it pretty clear what is about to happen for our guests. I’d love to hear about yours! Thanks so much for dropping by unseminary … I hope that your able to find some resources that help you lead your church better in the coming days! I’ve been involved in church leadership for over 15 years. Early on I had the privilege of leading in one of the very first multisite churches in North Amerca. I led the charge in helping The Meeting House in Toronto to become the leading multi-site church in Canada with over 4,000 people in 6 locations. (Today they are 13 locations with somewhere over 5,000 people attending.) In addition, I served on the leadership team of Connexus Community Church in Ontario, a North Point Community Church Strategic Partner. I currently serves as Operations Pastor at Liquid Church in the Manhattan facing suburbs of New Jersey. I have a dual vocational background that uniquely positions me for serving churches to multiply impact. While in the marketplace, I founded a dot-com with two partners in the late 90’s that worked to increase value for media firms and internet service providers. I’m married to Christine and we live in Scotch Plains, NJ with their two children and one dog. Great article, I am constantly looking to tweak the bulletin. There are some great ideas here. To John Heading's comment, I have used Publisher for my 11 years (I keep it updated to 2013 version) designing our church bulletin and really like it. It all comes down to what you like and what you are used to. I don't have time to learn a whole new desktop publishing program. Use what works for you. Christy, That's the format we just moved from. It has it's pros and cons. First of all, there is always room for whatever info you need to put in it (yet we somehow still needed inserts from time to time, go figure that one). Conversely though, what I ran into a lot, was trying to find filler to fill up all that space, but that was just an issue we had, may not be an issue for you guys (if you do have it though, I found a simple "Notes" Section with a bunch of lines was a GREAT filler). Also, IF your cover changes week to week or series to series, I found the dimensions hard to work with each time. However, I do like that the info is easy to navigate as well. One final note, since you provide your bulletin online, I would suggest lowering your file size as much as possible. You could probably cut about 25% of the file size out without any quality loss. It just helps with the loading time. I am interested to how many churches still put the "nickels and noses" (giving and attendance) in their Sunday bulletin? We stopped doing this the first of the year and the senior adults are constantly complaining that we are trying to "hide something." I noticed only 2 or 3 of the examples that continue to put giving info in the bulletin. Interesting thoughts. I'd love to be able to scrap the bulletin, but I'm interested in the sizes of the churches that scrapped them and their demographics. If there are a lot of the older generation, is that being received well and really working? John Heading, we actually use Photoshop, but I would guess most "professional" bulletin makers are using InDesign, but I could be wrong. I am just more comfortable in Photoshop. Another note on this, Publisher is certainly limiting, but you can still make nice looking things, it's really up to the space between the chair and the keyboard/mouse most of the time. http://spotswood.org/images/pdfs/bulletin.pdf We just did a total revamp on ours, this is lightyears beyond where it was. Still trying to learn how to have less clutter, but we're already cutting out too much for some people. I'm also having a difficult time with the older generation as far as readability goes. Oddly enough, they say it's color, not font size or type. Love the article. We have been thinking about gutting our bulletin and starting over. 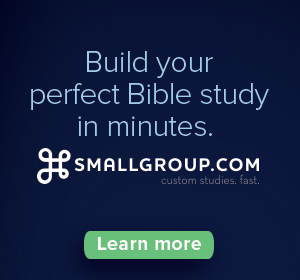 Is there a primary software that churches are using today? Microsoft Publisher looks more high school than professional. Any suggestions? Does Your Church Have a Content Strategy for Its Website?